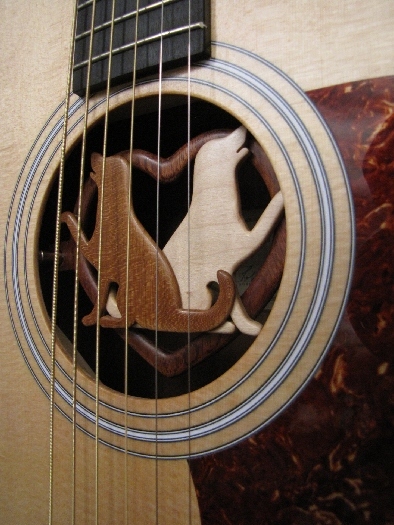 This is on the internal backstrip of the guitar. Custom decoration can be performed as a recessed cut-out or as a raised applique. Prices start at $50.00. This guitar was commissioned in honor of the clients infant daughter Ashley. The guitar has a Hawaiian theme with mango and koa woods. 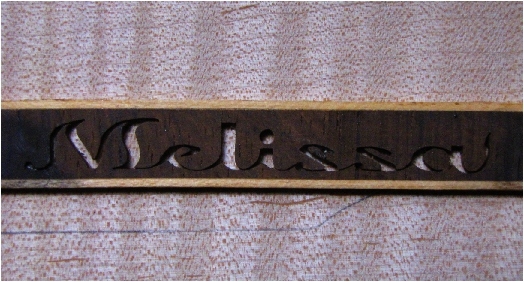 The backstrip is relief cut with her name, the hibiscus flowers are cut and carved from pink ivory wood. The guitar was topped of with her hand prints on the back. 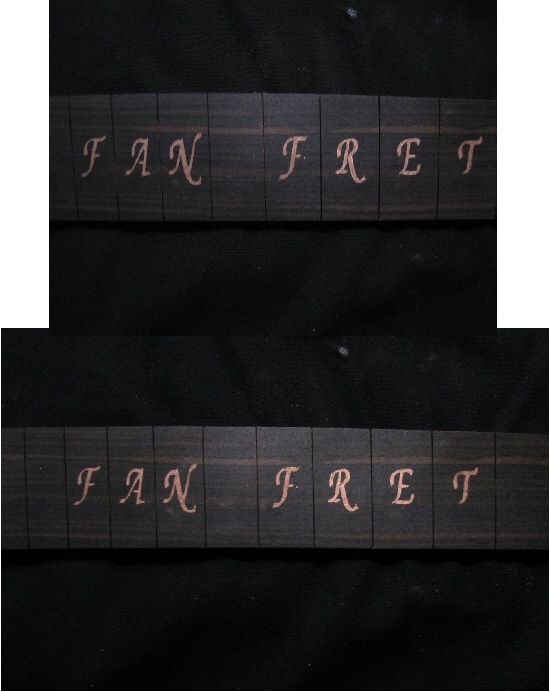 Custom backstrip for the internal guitar backstrip. 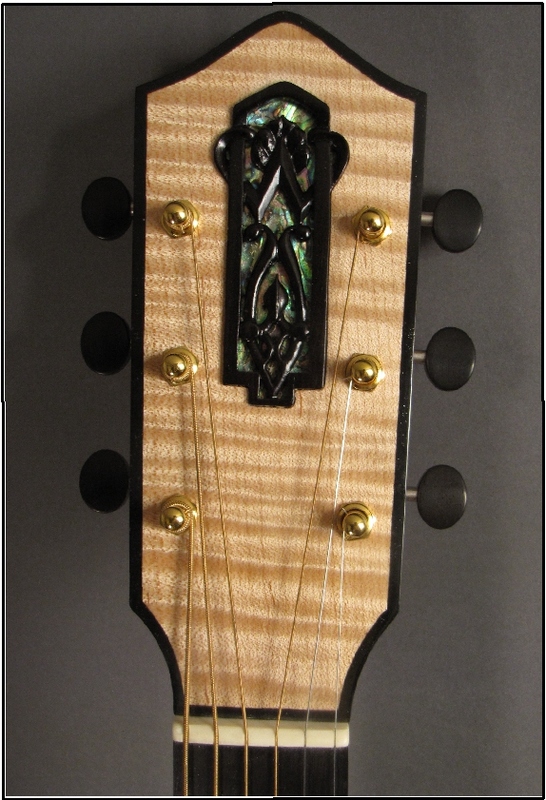 This is the carved Ebony headplate insert with abalone background. This headstock gives a stained glass effect. 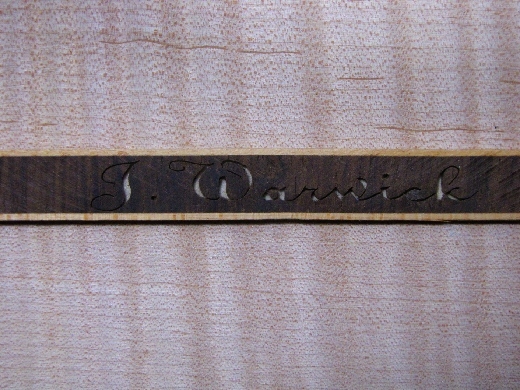 This is on a collaboration guitar with J. Warwick Guitars. 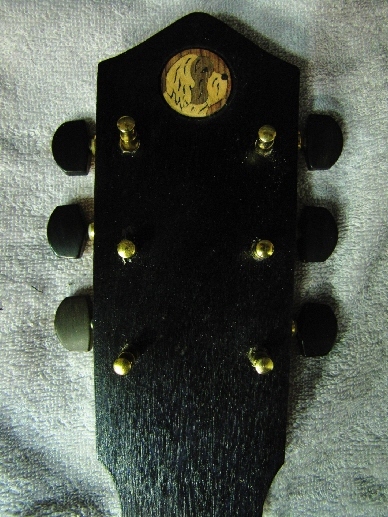 Here is a picture of the finshed headstock. This is one of my most elaborate carved heels on a collaboratoration guitar with J. Warwick Guitars. This is a Cherry neck with Walnut heel. 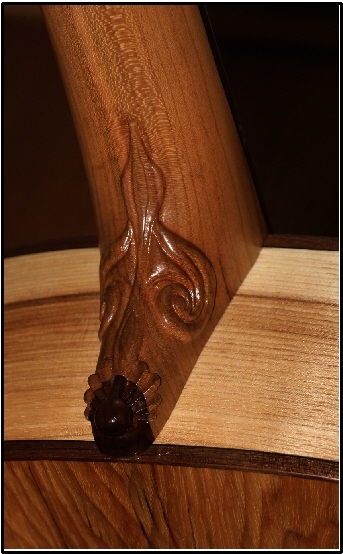 The carving is a combination of a commonly found design and my imagination. The heel carving was a design the client approved, the "ball and step" heel was an idea that I incorporated to tie the shaft of the heel to the cap. 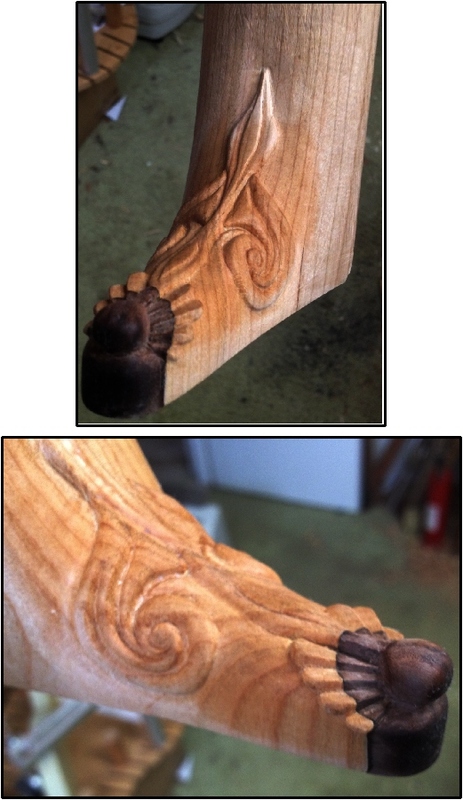 These pictures are of the neck with the carving finished. This is a picture of the finished neck and guitar. 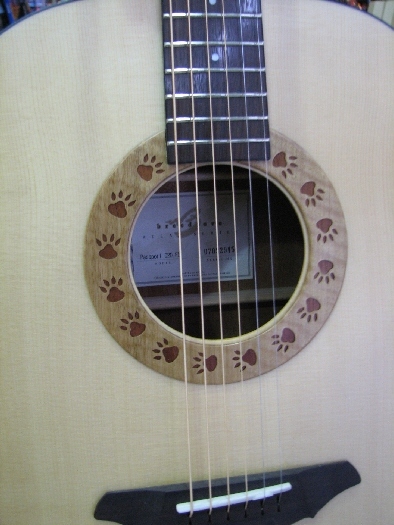 This rosette was done in two layer relief to give the apearance of dog paw prints in impressed in the wood. Prices available on a per quote basis. These inserts can be designed into an unbuilt guitar or added to an existing instrument. The inserts are held in place by magnets allowing for easy removal. Prices start at $100.00. This is a quarter sized headstock inlay created for a clients kit guitars. Custom scrolled and inlayed fingerboard. Prices vary depending on inlay. A variety of relief carvings can be performed on neck heels. This is an Art-Nouveau inspired carving. Prices start at $150.00. *Note* I do not perform heel carvings on existing guitars. The carving must be performed before the neck has been finished or attached to the guitar body. This cover is produced in two layers to give "depth" to the cover. 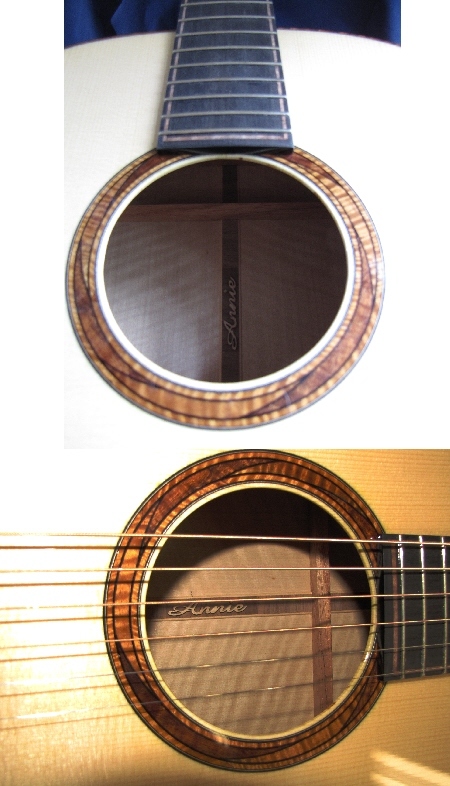 Various colors and wood types can be used to match the guitar or create a desired effect. Prices start at $50.00. This a great example of the use of various hardwoods to create a desired effect. In this case the school colors of a client. Prices start at $50.00.